We’d love your help. Let us know what’s wrong with this preview of The Hummingbird by Stephen P. Kiernan. Deborah Birch is a seasoned hospice nurse whose daily work requires courage and compassion. But her skills and experience are tested in new and dramatic ways when her easygoing husband, Michael, returns from his third deployment to Iraq haunted by night From the author of the acclaimed The Curiosity comes a compelling and moving story of compassion, courage, and redemption. To ask other readers questions about The Hummingbird, please sign up. Deborah Birch , a hospice nurse wants so much for her dying patients - a pain free death with dignity and peace and emotional healing. The story is quite sobering as it depicts the dying process of one man, Barclay Reed , a historian and former professor with a tarnished reputation . She also wants so much for her husband, Michael , a returning soldier with PTSD - a pain free life with dignity and peace and emotional healing . This is one of those stories that gets you in the gut as Deborah give Deborah Birch , a hospice nurse wants so much for her dying patients - a pain free death with dignity and peace and emotional healing. The story is quite sobering as it depicts the dying process of one man, Barclay Reed , a historian and former professor with a tarnished reputation . She also wants so much for her husband, Michael , a returning soldier with PTSD - a pain free life with dignity and peace and emotional healing . This is one of those stories that gets you in the gut as Deborah gives of herself with compassion and understanding to help her patient with his journey to death while trying to help her husband live . There are alternating narratives - Deborah's in present day and the other , a book written by the professor . At first I felt a bit distracted by the professor's story but surprisingly as it continued, I found myself interested in this story about war and the Japanese fighter pilot who dropped bombs in Oregon in 1942 . I never learned that in school so a quick internet search indicates that it did actually happen and the author confirms that in his notes. It's easy to connect with Deborah as we learn about her life with Michael before his tours , and her experiences with her past patients, and also with Barclay who eventually opens up to Deborah . But I found it more difficult to know her husband Michael and perhaps that was indicative of his state of mind . It is with Barclay's story that Deborah and the reader get a better understanding of Michael's pain. The recurrence of the hummingbird, a carved figure given as gift to Deborah and also painted on the bottom of a stoneware bowl owned by the professor emanate the hope that as a reader I was desperately seeking in the life and death circumstances of this novel . Definitely recommended. The Hook Author Stephen P. Kiernan was a speaker at Booktopia 2016 sponsored by Northshire Bookstore in Manchester, Vermont. Though Kiernan was promoting this, The Hummingbird, his latest book, it was when he spoke about end of life issues, both of the living and the dying, that I knew I had to read his books. The Sinker – Stephen P. Kiernan has an interesting background. In addition to many hats he has worn, he is a journalist, one who has interviewed thousands of family members of the dying. Kiernan has given many talks regarding how our deaths are complicated by our health care systems. He is the author of several books including Last Rights: Rescuing the End of Life from the Medical System which I have purchased but have yet to read. I have to admit I was curious to see what Kiernan would do with the fictional The Hummingbird. I am truly in awe of the book and the man. As many good books do, Kiernan presents a simple premise. Hospice Nurse, Deborah Birch spends her days helping those nearing death. Her current patient, the elder Professor Barclay Reed has fired many attendants. Birch and he are able to form a bond somehow, initially by her skill of listening and soon by reading with and to Barclay, his unpublished work about the only Japanese bombing on the US in World War II. As they work towards Reed’s final hours, Birch gets as much as she gives as he helps her to heal the breach in her marriage with her husband Michael who battles the demons of his experiences from three deployments in Iraq. Kirkus Reviews states ”Kiernan (The Curiosity, 2013) seeds this saga with occasional sanctimony, bald symbolism, and overly facile epiphanies. Tackles but ultimately oversimplifies thorny issues. I do not agree. I think Kiernan does a fine job of tackling the issues with insight regarding the problems our returning vets endure, the purpose, the comfort and necessity of Hospice Care for both patient and family while delivering a story with compassion, passion, and beauty. In alternate narratives, Kiernan expertly weaves these three plots, the marriage, the journey to death and the essay about Japanese pilot, Ichiro Soga, who dropped the bombs in the virgin timber of Oregon seamlessly. "We live our lives on a whole planet, seeing and learning and going from place to place. But eventually there arrives a time for each of us, when our world becomes smaller: one house, one floor of that house, and near the end, one room, one little room to which our whole gigantic life has been reduced. And when that happens . . . that room becomes sacred. It is the holy, modest place in which we will perform perhaps the hardest task of our life: letting it go." At present, I have not the composure to adequately describe how deeply moved I was by this hauntingly beautiful, deeply affecting novel. Let me just say, it is absolutely surreal, the vast emotions one's heart can experience -simultaneously and without end - through brilliantly penned literature, where no word is wasted and no page is passed over. "War does ugly things . . . Its necessities turn good people into ugly creatures. In all nations this is true. All creeds, all races. Once fighting ends, both victor and defeated must choose: to deny what took place and resume life as before, or to acknowledge the moral consequence for what war required them to do. I belong to the second group." Hope and despair. Love and loss. Anger and acceptance. Aggression and surrender. These are all emotions that we as human beings will feel at some point in our lives and all are touched on in this quietly affirmative novel. The Hummingbird is narrated in first person by Deborah Birch, a hospice nurse with years of experience caring for and standing by her patients as they leave the world. I believe it takes a special kind of person to do a job like that over and over again without spiraling into Hope and despair. Love and loss. Anger and acceptance. Aggression and surrender. These are all emotions that we as human beings will feel at some point in our lives and all are touched on in this quietly affirmative novel. The Hummingbird is narrated in first person by Deborah Birch, a hospice nurse with years of experience caring for and standing by her patients as they leave the world. I believe it takes a special kind of person to do a job like that over and over again without spiraling into either depression or indifference. Instead, Deborah takes something personal and positive from the death of each of her patients. There were times I felt she might actually be a little too good to be true but in the end, I was ok with that. Threaded between each of the main chapters is a secondary story about a Japanese WWII bomber pilot and his relations with the American town he once bombed during the war. By providing an analysis on the moral implications of killing during times of war, it handily parallels the struggles that Deborah’s husband is also facing having just returned from war himself. Without allowing spoiler alerts, I try to give an assessment of what I learned or what I liked about a novel when I write my reviews. Also, I try not to “re-do” the book jacket synopsis. Feelings on the novel are on the forefront. That said, I thought THE HUMMINGBIRD did an excellent job of providing the reader information on a really good Hospice Care providers. In my personal history, both of my parents died of cancer, at different years. Both wanted to die at home and had hospice. I can say ou Without allowing spoiler alerts, I try to give an assessment of what I learned or what I liked about a novel when I write my reviews. Also, I try not to “re-do” the book jacket synopsis. Feelings on the novel are on the forefront. That said, I thought THE HUMMINGBIRD did an excellent job of providing the reader information on a really good Hospice Care providers. In my personal history, both of my parents died of cancer, at different years. Both wanted to die at home and had hospice. I can say our family had a really terrible Hospice experience on both deaths. Boy, do I wish we had Deborah from this novel. I am hoping that Kiernan has had experience and has been involved with this sort of hospice care (that it’s not all fiction). Kiernan provides humanity to the hospice experience. I wished we had had the wisdom and guidance that Deborah provided. This is a great fiction novel to read if you have a love one who has terminal cancer. The other information I gleaned from this novel is the affects of PTSS on the wives of returning servicemen. After watching “American Sniper” and the fabulous Bradley Cooper, I got a glimpse of the agony; this novel provides another personal view of living with and loving a person with PTSS. Finally, I promise you will learn a tidbit about WWII that you never knew; never heard of; and is a bit of a surprise. I liked this novel more than his previous novel “The Curiosity”. Perhaps it’s because it struck home to me. I enjoy books that illuminate life and provide a different prospective than the prospective I had. My feelings of hospice have changed, and I’m illuminated and have sympathy to our returning war veterans and their families. Oh, my! Oh, my! Oh, my! I so loved this book. I truly believe only a sensitive soul could have written this book. It touched me deeply - perhaps because I had so many friends die this past year. If I say this is a love story, you will get the wrong impression. I truly believe that Deb, the protagonist, is completely motivated by love both for her husband and her patients - she is a hospice nurse. She learns from her latest patient ways to help her husband who suffers from PTSD. I'm glad I own this Oh, my! Oh, my! Oh, my! I'm glad I own this book so I can revisit this treasure whenever I want. A couple of years ago, author and journalist Stephen P. Kiernan made his fiction debut with his novel The Curiosity. That book, about a man reanimated from death, showcased Kiernan's aptitude for a creative character driven story that defied the confines of traditional genres and left an indelible mark in the hearts and minds of readers. 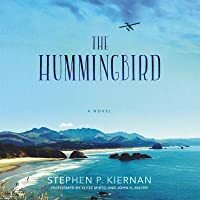 In his sophomore novel, The Hummingbird, Kiernan trades in the high concept premise of his debut for a more intimate narrative that is remarkably understated, b A couple of years ago, author and journalist Stephen P. Kiernan made his fiction debut with his novel The Curiosity. That book, about a man reanimated from death, showcased Kiernan's aptitude for a creative character driven story that defied the confines of traditional genres and left an indelible mark in the hearts and minds of readers. 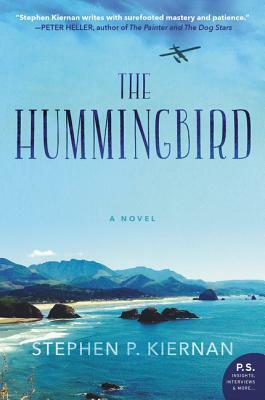 In his sophomore novel, The Hummingbird, Kiernan trades in the high concept premise of his debut for a more intimate narrative that is remarkably understated, but equally affecting. Deborah Birch is no stranger to death. As a hospice nurse, she helps people and their families to pass over with dignity, compassion, and peace. Shepherding her patients to the other side brings Deborah slices of insight about life, family, and love, all of which she relates to her own life and to those of future clients. But all of her past experiences have done little to prepare her for the challenges that she currently faces. Deborah's husband, Michael, is a war veteran who is struggling to acclimate to his life outside of the military. Three tours as a sniper in the Middle East have left him a shell of his former self and caused a rift between him and his wife. Anger issues caused from PTSD only magnify the fear and uncertainty in the couple's rocky relationship. Try as she might, Deborah can't seem to break through to the man she loves so deeply. The challenges are only intensified when Deborah enters the home of her latest patient Barclay Reed. The former history professor is facing an incurable illness that will soon end his life. He spends his days alone in his sizable estate on the Pacific Coast, thinking back on his academic career and the disgrace that led to its demise. Ridiculous demands and an abrasive temper have made it impossible for Reed to keep a hospice nurse for more than one day at a time. As the fourth nurse from her company to attend to Reed's needs and with no surviving family to intervene, Deborah is his last hope. Slowly, a mutual trust and understanding begins to form. Reed is a bitter and jaded old man, but underneath that hardened exterior lies a fiercely intelligent man full of knowledge and wisdom about history and life. As Deborah and Reed grow closer, they begin to share about their lives. Deborah tells him of the problems with her husband, and Reed tells her of the last book he was working on. This book, about a Japanese pilot bomber in WWII, was deemed as fabricated plagiarism by Reed's colleagues and became a scandalous end to his distinguished career. As Reed approaches his final days, he has Deborah read from this book and wills her to come to her own opinion about its validity. I have to admit that it was the title that first drew me to this book as I love anything at all to do with hummingbirds. Although there was only a slight reference to the meaning of the title in the book, this gorgeous novel did not disappoint in any way. There are actually three stories in this book. The first deals with a very caring hospice worker, Deborah Birch, and her work with a patient, Barclay Reed, who is a professor and expert on the Pacific Theater of World War II. Deborah is assigned I have to admit that it was the title that first drew me to this book as I love anything at all to do with hummingbirds. Although there was only a slight reference to the meaning of the title in the book, this gorgeous novel did not disappoint in any way. There are actually three stories in this book. The first deals with a very caring hospice worker, Deborah Birch, and her work with a patient, Barclay Reed, who is a professor and expert on the Pacific Theater of World War II. Deborah is assigned the tough cases and Professor Reed is certainly a tough nut to crack. Their developing relationship and journey toward the end of Professor Reed’s life is a beautiful and emotional one. The gift Deborah receives in return for her loving care is indeed a priceless one. The second story deals with Deborah’s husband, Michael. He’s a severely damaged war veteran dealing with the memories of the atrocities that he’s encountered and the ghosts that haunt him. Their story will break your heart as her husband struggles to heal and they try to piece their marriage back together. The third story is an extraordinary one about a World War II Japanese pilot who fire bombs a forest in the US and his journey towards redemption and forgiveness. It’s one that you won’t soon forget and I found it to be a very powerful lesson. I’ve read a few reviews saying that this book is sappy. I don’t like sappy books and didn’t find this one to be sappy at all. I thought it was beautifully written, moving, touching and emotional with strong insight into the human soul. The author has a true heart of a poet. I can’t wait to read his first novel, “The Curiosity”, although it sounds like a very different type of book. I won an ARC of this book through The Reading Room with the request that I give an honest review. This book has been languishing on my TBR since 2015. Thankfully a new book club I just joined had selected it for their December read. I LOVED the book. Excellent Historical Fiction that revealed to me something I did not know before. Very strong character development with some unique (not all endearing, just unique!!) personalities. This is the story of Deborah Birch, a hospice nurse; Michael, her husband, who has endured three tours of duty to Iraq and is suffering the consequences; and Barclay This book has been languishing on my TBR since 2015. Thankfully a new book club I just joined had selected it for their December read. This is the story of Deborah Birch, a hospice nurse; Michael, her husband, who has endured three tours of duty to Iraq and is suffering the consequences; and Barclay Reed, a disgraced history professor, who is dying from cancer. The setting is Oregon in the 2000's. We do, through the professor, return to WWII and discover some events that no one seems to know anything about. Well, at least not Nurse Birch, who the professor challenges to listen to this story and determine if it is true. There is a lot of synergy occurring here. Deborah helping the professor to cope with his last days and struggling to help her husband heal. The Professor helping Deborah to help her husband heal. At Book Club, much discussion occurred about the merits of the book and the members' own experience with the death of a loved one and the effects of war on their spouses or friends. One comment that came out: the book, though written by a male, shows a certain understanding of the female psyche!! Recommended to those who love diverse culture (Japanese culture explored), historical fiction, and medical novels, as the role of a hospice nurse is beautifully revealed. Many thanks to librarything.com for the advanced uncorrected proof of The Hummingbird by Stephen P. Kiernan in return for my honest review. I generally will not read morbidly depressing stories, regardless of their literary merit. Thus, I was hesitant about reading The Hummingbird as the subject matter of the book alternated between Hospice care and the rehabilitation of an Iraqi war veteran severely damaged emotionally during his third deployment. However, this book surprised me in the very best Many thanks to librarything.com for the advanced uncorrected proof of The Hummingbird by Stephen P. Kiernan in return for my honest review. I generally will not read morbidly depressing stories, regardless of their literary merit. Thus, I was hesitant about reading The Hummingbird as the subject matter of the book alternated between Hospice care and the rehabilitation of an Iraqi war veteran severely damaged emotionally during his third deployment. However, this book surprised me in the very best of ways. This was a fascinating novel. I just loved it. Yes, the story was about death and the cruelties of war, but it was so well done, and despite the subject matter, was one of the most hopeful and inspiring stories that I have read in a very long time. It is a smart, thought-provoking book. The main character, suffering with her own personal family matters, was a tender and incredibly kind care-giver who dedicated her life to making terminally ill patients feel cared for and loved in their final days. There were a couple of issues though, I absolutely hated that the main character and her husband called each other "lover". It was distracting and somewhat irritating. Additionally, the main story is disrupted with excerpts from a book documenting a WWII Japanese pilot responsible for dropping incendiary bombs over the Oregon Coast, but who subsequently dedicated his life to making amends for his actions and being a symbol of peace. These excerpts initially were confusing and broke the flow of the main story, but subsequently became less distracting and even enhanced the novel. This might be a good book club read. However, it was not for me. The novel is about a hospice nurse named Debby Birch who is caring for Barclay Reed, a dying man who is an expert on World War II. He is cantankerous and difficult. By the time Debby comes to care for him, Barclay has gone through two other nurses and the other two hospice agencies in the area. On the home front, Debby is dealing with a husband who has returned from two deployments and is a changed man. He suffers from PTSD and Debb This might be a good book club read. However, it was not for me. The novel is about a hospice nurse named Debby Birch who is caring for Barclay Reed, a dying man who is an expert on World War II. He is cantankerous and difficult. By the time Debby comes to care for him, Barclay has gone through two other nurses and the other two hospice agencies in the area. On the home front, Debby is dealing with a husband who has returned from two deployments and is a changed man. He suffers from PTSD and Debby is never sure what each day will bring. Her goal is to stay married but she is holding on by a shoe string. The chapters are interspersed with information about Japanese warfare which I found very boring. I don't think it added anything to the book. Rather, it detracted from it. I don't think most people will be interested in these asides. Get ready to stay up way too late and get nothing done! This book is delicious! The characters stories unfold and weave together so beautifully. They are the characters that stick with you for weeks on end and leave you desperately searching for another book to connect to. I felt like the entire book just poured out of Kiernan and loved the way it was organized and developed. An emotionally rich book. All of the characters in this book were dealing with complex life changing issues. They learned from and came to the aid of each other (often in subtle, unassuming ways). For a book that could very well have been overwhelmingly sad, that wasn't the case for me. There were varying degrees of closure and what was described as "loving lies". And amongst other things hope. I wholeheartedly recommend this excellent book. This is a story that hit a little close to home at the moment so I am not sure if I can give it a truly unbiased review. So this will be a short one. This is a story of someone who is dying from a horrible disease and the caretaker whose job it is to stay with him until he passes. It is the story of healing during the dying process as well as a story of learning and growing right up until the end. It is a story about how those at the end of their path still have the ability to teach those who are not. I found this to be a moving story. From Barclay's story of Cancer to Michael's struggle with integrating back in to life following three deployments, it is one that consumes you emotionally. Then for extra interest there is the story of WWII just to add a little bit extra. Deborah Birch, is a hospice nurse, in Portland, Oregon. She is very good at her job, but her home life is a mess. Her mechanic husband, has returned from Iraq, after serving three deployments. He is not the same man she married and he is tormented by many horrors. This may be the biggest challenge of her life. Adding to her woes, is her current patient, Barclay Reed, a retired history professor, who is a crabby, self-absorbed jerk, who is dying from kidney cancer. Their relationship deepens, as D Deborah Birch, is a hospice nurse, in Portland, Oregon. She is very good at her job, but her home life is a mess. Her mechanic husband, has returned from Iraq, after serving three deployments. He is not the same man she married and he is tormented by many horrors. This may be the biggest challenge of her life. Adding to her woes, is her current patient, Barclay Reed, a retired history professor, who is a crabby, self-absorbed jerk, who is dying from kidney cancer. Their relationship deepens, as Deborah reads to him, an unfinished manuscript, that he wrote, about WWII. This sets them on a journey, of discovery, forgiveness and healing. It also sets Deborah on a path, of how to help her husband through his nightmares and demons. The writing was really clunky at times, and is there a couple alive who legit regularly call each other "lover"? I hope not. But, I thought the portrayal of PTSD was nuanced and eye opening, and I loved the bits of wisdom gained through hospice care. What a rewarding but I'm sure exhausting field. I thought the WWII background story was fascinating. As a dedicated hospice nurse, Deborah Birch is compassionate, confident and skillful in helping her patients through their last struggles. As the wife of Michael, a 3-time deployed veteran of Iraq, Deb is less certain of her role in his life. Michael has turned cold, tortured by nightmares and the beginnings of violent behavior have begun to show. Deb feels helpless in her marriage but will try anything to reach the loving man she knows is still inside her husband. Barclay Reed is Deb's latest pa As a dedicated hospice nurse, Deborah Birch is compassionate, confident and skillful in helping her patients through their last struggles. As the wife of Michael, a 3-time deployed veteran of Iraq, Deb is less certain of her role in his life. Michael has turned cold, tortured by nightmares and the beginnings of violent behavior have begun to show. Deb feels helpless in her marriage but will try anything to reach the loving man she knows is still inside her husband. Barclay Reed is Deb's latest patient, a retired history professor in the final stages of kidney cancer. Curmudgeon would be a kind word to use about Barclay; he is gruff, demanding and verbally abusive. Slowly, Deb is able to break through his hard shell as she patiently listens to his history lectures and reads to him from his unpublished WWII book "The Sword". The book deals with a little known attack on the Oregon coastline by the Japanese in 1942. The book also led to a huge scandal that discredited Professor Reed and led to his firing from his university position. Barclay hesitantly opens up to Deb about his past while giving her insights into her husband's behavior and ways that she might heal Michael's torment. Page 184 - "War does ugly things....Once fighting ends, both victor and defeated must choose: to deny what took place and resume life as before, or to acknowledge the moral consequences of what war required them to do. I belong to the second group." When I was a kid, our neighbor had a Russian nesting doll on her end-table. If she was in the mood, she would let me play with those dolls. Sitting on the floor at her and my mother's feet- I would nest and un-nest those dolls over and over: big, medium, small, smaller, tiny, tiny, smaller, small, medium, biggest. It was one of my childhood delights and one of the few memories I hold for my own self, not a memory that was planted from photos or someone else's story that I absconded with. The Humm When I was a kid, our neighbor had a Russian nesting doll on her end-table. If she was in the mood, she would let me play with those dolls. Sitting on the floor at her and my mother's feet- I would nest and un-nest those dolls over and over: big, medium, small, smaller, tiny, tiny, smaller, small, medium, biggest. The Hummingbird is a Russian nesting doll: three stories tucked inside of each other, each one bigger, then smaller, then bigger again. Tucked and tucked and tucked. Delightful and hard at the same time, but worth it. I didn’t have any idea what to expect when I started this book, and I’m glad for it. Mysteries unfold within that I’m glad I had no warning about, and at its core is a deeply relatable story about the things every single one of us must face at some point in our lives; namely, the realities of life and the end of life itself. It is a deeply satisfying story. Do yourself a favor and read the notes at the end, too. It made me look at my job from a different perspective. Loved it! I must admit I skipped over some of the historical parts of a couple of chapters because I was so eager to get back to Nurse Birch's story. I finally caught on. Loved the story and the surprises. I listened to this incredible story on audible. The performance was excellent! Stephen Kieran is a Master Story Teller. This is a story about loss, war, forgiveness that reaches deep into the heart. Highly recommend this incredible story! “How old am I again?" He wagged his head. "How in the hell did that happen?" "That you've lived so many years?"